It appears from these results that the Zeeman effect is a much more complex phenomenon than was at first supposed, and therefore the simple explanation that was given above no longer applies. At any rate, it nfust be very seriously modified in order to account for the much more highly complex character of the phenomena, as here described. The complete theory has not yet been worked out, and meanwhile we must gather whatever information we can concerning the behavior of as many different radiations as possible. Every attempt to deduce some general law which will cover all cases at present known has thus far proved unsuccessful. There are a number of anomalies which seem even more difficult to account for than the doubling of this middle line and the multiplication of the side lines. 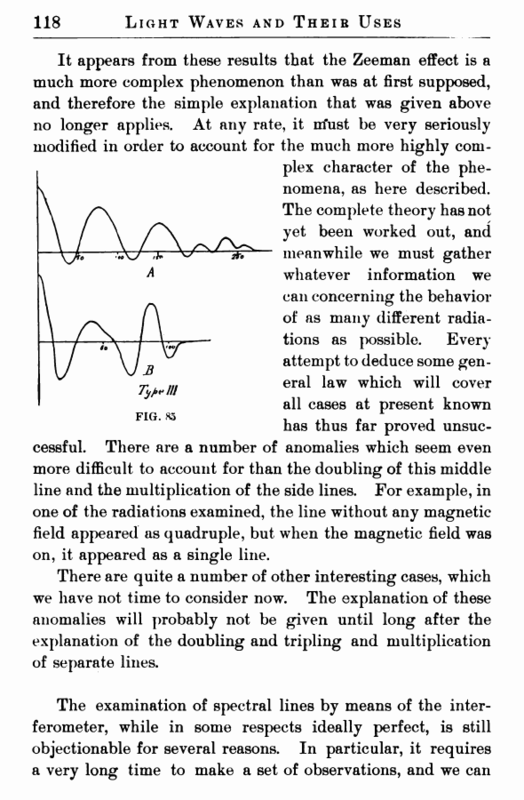 For example, in one of the radiations examined, the line without any magnetic field appeared as quadruple, but when the magnetic field was on, it appeared as a single line. There are quite a number of other interesting cases, which we have not time to consider now. The explanation of these anomalies will probably not be given until long after the explanation of the doubling and tripling and multiplication of separate lines. examine only one line at a time. The method of observation requires us to stop at each turn of the screw, and note the visibility of the fringes at each stopping-place. During the comparatively long time which it takes to do this the character of the radiations themselves may change. Besides, we have the trouble of translating our visibility curves into distribution curves. Hence it is rather easy for errors to creep in. 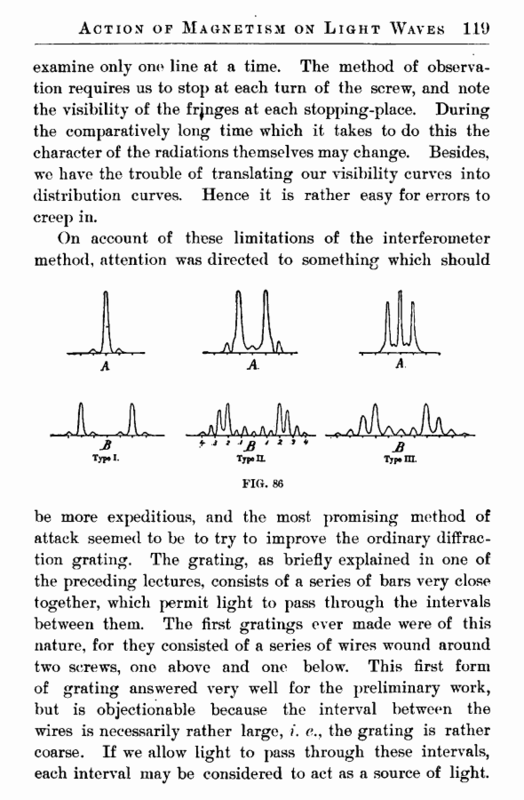 be more expeditious, and the most promising method of attack seemed to be to try to improve the ordinary diffraction grating. The grating, as briefly explained in one of the preceding lectures, consists of a series of bars very close together, which permit light to pass through the intervals between them. The first gratings ever made were of this nature, for they consisted of a series of wires wound around two screws, one above and one below. This first form of grating answered very well for the preliminary work, but is objectionable because the interval between the wires is necessarily rather large, i. e., the grating is rather coarse. If we allow light to pass through these intervals, each interval may be considered to act as a source of light.